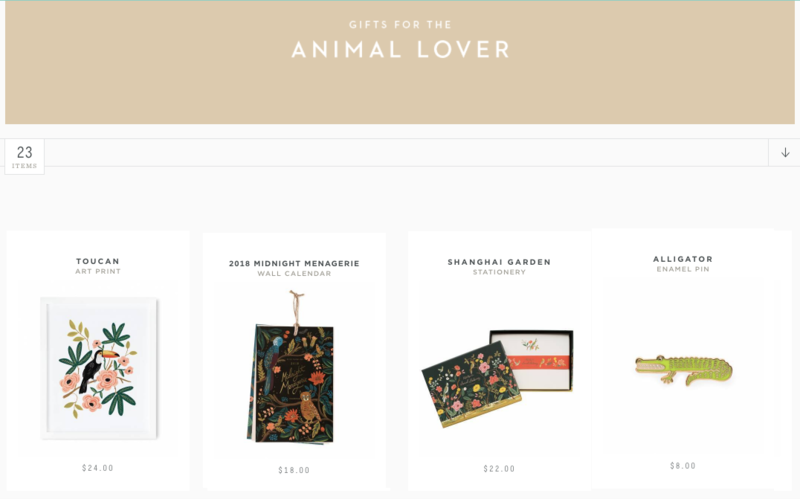 Gift guides are a way to highlight products from your catalog to your customers. They are a way give your customers inspiration for any holiday, season, or event that they might need a gift for. With hordes of customers purchasing online to complete their last minute shopping this year, consider creating a gift guide to reach these last-minute customers. 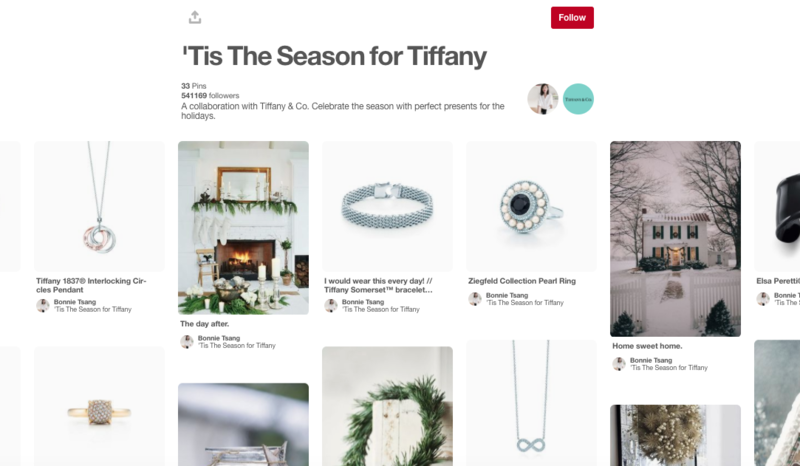 We’ve mentioned using gift guides before – they are a great holiday marketing tool, a clever way to utilize your brand’s Pinterest account, and make a topic that is both fun and useful for customers on your company blog. Here are the tips you need to create an inspirational gift guide that helps you sell more all year. When creating a holiday gift guide, you want your brand and products to really shine. How much do these customers usually spend? Do these customers spend more at certain times of the year? Who are these customers shopping for? Demographics will vary between businesses, but the answers to these questions will be the foundation for what sort of gift guide you create. Give your gift guide a clear and concise theme. By organizing your gift guide to a clear theme or category you will help your customers find what they are looking for faster and easier by clearly stating the theme of the guide up front. This gift guide from Urban Outfitters is themed around beauty products. Include products with a range of price points to appeal to the largest possible audience. By including items with a variety of prices, you will be able to provide suggestions that all of your customers can afford, giving you the highest amount of potential sales. When choosing the products to include in your gift guide be sure to choose gifts that are readily available. Avoid any products that are out of stock, close to running out of stock, take a long time to make, or that you are planning to discontinue. Also, consider your ability to ship the product quickly and have it arrive on time, many people use gift guides for last minute gift ideas so you need to be able to deliver your products quickly. If the products in your gift guide are not readily available you will be spending time and effort driving traffic to products that ultimately customers cannot buy – creating disappointment for them, and lost profits for you. You might be tempted to put hundreds of items into your gift guide. Having too many products is a sure fire way to overwhelm your customers. Gift guides are supposed to be a quick and easy way to get a gift idea, holiday shoppers have less time to spend searching for gifts, if your customer has to browse through multiple pages of products it defeats the point. Keep it quick and simple – consider highlighting between 3 and 12 products in your guide. Remember, you can create more than one gift guide to fit different themes, so you don’t need to highlight every single product in your catalog. 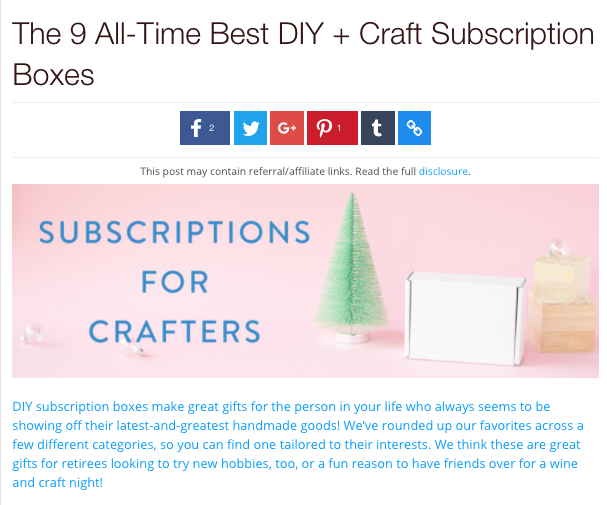 My Subscription Addiction, a website that reviews and promotes different subscription boxes, focuses on highlighting 9 of the best boxes for crafters on their blog. Gift guides are a great marketing tool to entice customers to purchase. In eCommerce customers have to rely on visuals and product descriptions to inform their purchases. You should showcase items with the same standards as you would showcase them on a product page – with high resolution, striking photos. You may want to consider utilizing some lifestyle shots so that customers can see the product in action. 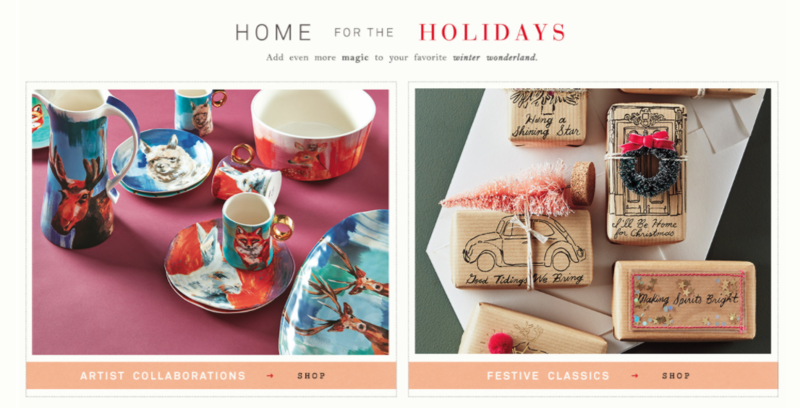 Clothing and lifestyle item retailer Anthropologie using striking lifestyle photos in their gift guides. Regardless of how you choose to publish your gift guide, your guide needs to be organized and easy to navigate. It should be easy for your customers to make a purchase from your gift guide. There is a huge variety of ways to publish your gift guide and get the information to your customers. When deciding which option is best for your business, think about where your audience hangs out online and where you see the highest levels of interaction form your other marketing activities. Company blog: Using a gift guide as the topic for a blog post is a simple way to populate your blog with useful and interesting content that also promotes your products. For example, TechCrunch has a variety of different gift guides with slide shows of products up on their blog – like this guide to 11 Bragworthy Gifts. 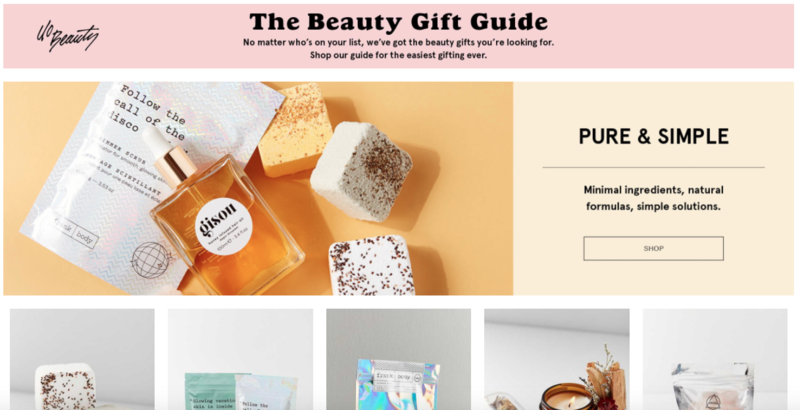 Section of your website: You could create an entire section of your website dedicated to gift guides, making it easy for customers to navigate to from your main pages and menus. 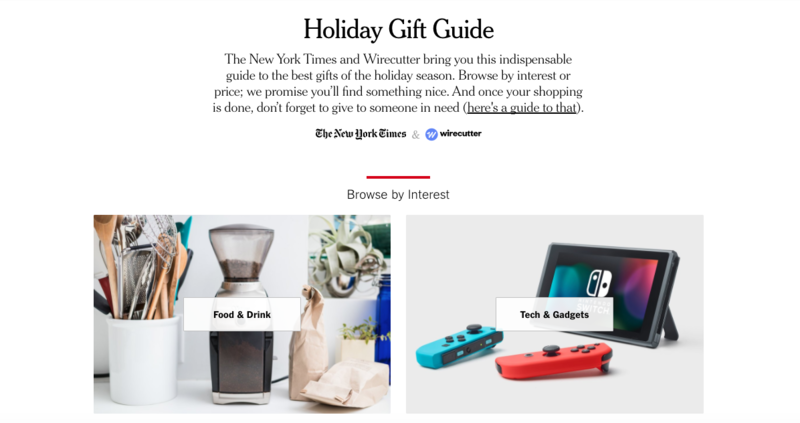 For example, The New York Times has a dedicated section to holiday gift guides. Email Blast: Email marketing campaigns, particularly around the holidays can have a huge ROI. Studies show that for every $1 you spend on email marketing you can expect $38 back in return.This makes email marketing a natural location to publish your gift guide. 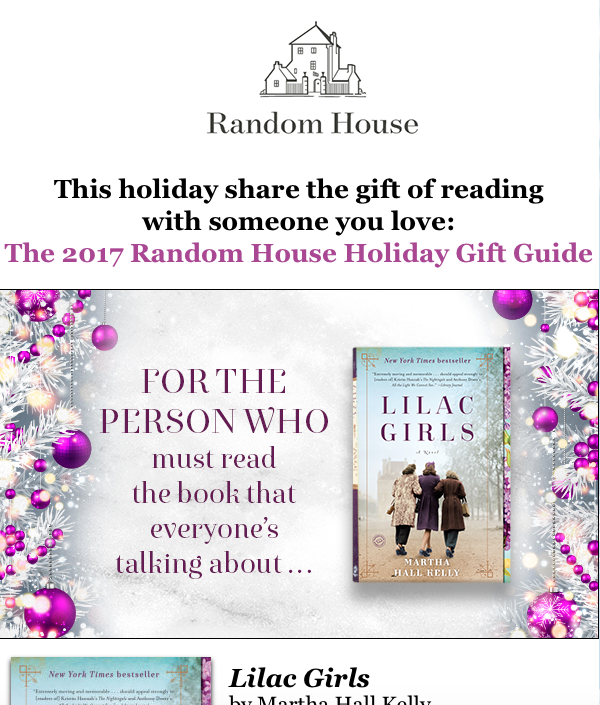 For example, Random House distributes their “must read” gift guide for the holidays through an email marketing blast. You’ll want to make sure your new gift guide gets the maximum amount of exposure. Use your social media platforms to let people know about your guide. Consider getting creative – one company might Tweet out a single link to their new guide, but consider using a series of tweets to talk about each product in your guide to increase reach and engagement. Don’t forget to make sure your guide is SEO friendly. It is always beneficial to take the time to write product copy that will help put you at the top of the search engine results. When writing descriptions for your gift guide make sure you include why these items are great gifts, and for whom they make great gifts. Everyone wants a deal around the holidays, so consider using your title tags and meta descriptions to highlight any deals or limited time offers associated with the products in your guide. Gift guides are relevant all year, not just around the busy fourth quarter holidays. All year long people buy gifts for various reasons. Any occasion that your customers might need to purchase a gift is a great opportunity to make a gift guide. Get creative with your guides to make this tool work for you all year. Are you using gift guides to promote your products? Let us know! 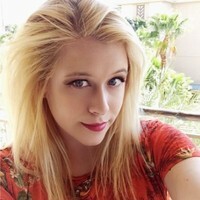 Connect with us on Twitter or Facebook and send us your gift guide! Need help with Magento development and optimizing your eCommerce digital marketing plan? Connect with a member of our strategy team today and start reaching your eCommerce goals.